Italian Provincial tours is owned and operated by husband and wife, Marco and Katri Pagliaro. Marco was born in Pescara, Abruzzo in Italy and moved to Melbourne, Australia at a young age with his parents and two younger siblings. Although he has lived most of his life in Australia, his passion for his Italian culture has stayed strong. Katri grew up on the cost of Western Australia, moved to Melbourne as an adult and has always had a passion for Italian culture and cuisine. They met in Melbourne and married a couple of years later, in 2006. They began to travel to Italy together and their united love and passion for Italy and all things Italian grew. When in Italy they would visit the well known places but most of their time was spent in Abruzzo with Marco’s extended family and friends. 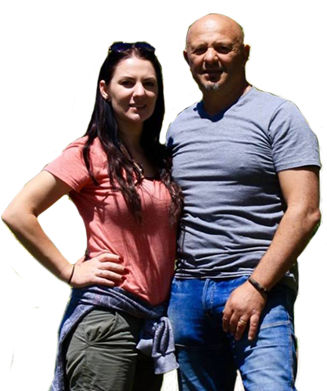 It’s a region that is mostly unheard of by travellers to Italy, but Marco and Katri felt like they were in the real Italy when they were in Abruzzo and away from the hustle and bustle of the more well known places. They begun to realise that most travellers to Italy were being shuttled to place after place, sight, after sight, and missing out on an authentic Italian experience. They realised that it can be difficult for travellers to get off the tourist routes: Driving and car hire can be a problem, language barriers can make communication difficult, and without the well written guides and maps of the more popular areas how can one know where to go? This set them dreaming about running a tour company that would be about giving travellers an authentic experience. A tour company that gets off the beaten track, mingles with the local people, allows travellers to settle in to the relaxed pace of life. A tour company that lets you experience the real Italy.